I get tired of the atheist canard that religion has killed more people in history than any other ideology. First, they are willing to attribute wars to Christianity that were more political than religious, and second, they are unwilling to own the atrocities of atheistic communism. But let’s be fair – if the Christians can be saddled with the Inquisition (a political power play by the King of Spain) or the Crusades (a justified defensive war after 400 years of Muslim conquest), then atheists should own the atrocities of the political movements of which atheism was a central tenet, particularly Communism. I limited my spreadsheet to conflicts that killed more than 750,000 people (although not sure if the Islam Killings site did that, so their numbers might be slightly inflated). Who has killed the most? Power hungry men bent on Empire. Especially in China. Yes. 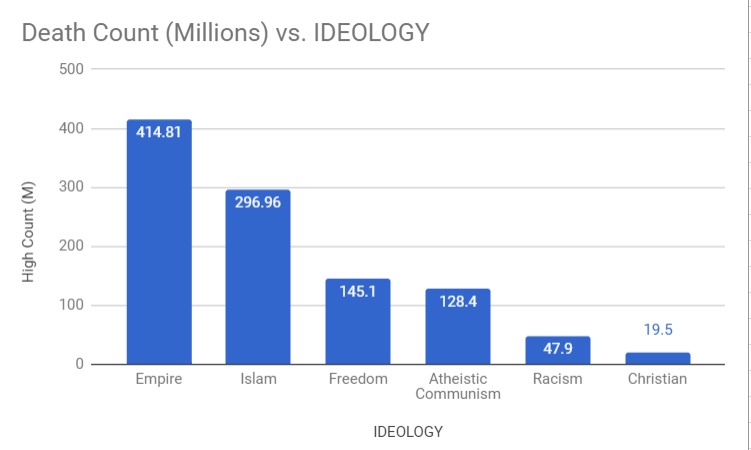 When atheists claim that religion has killed millions, they are mostly referring to Islam. But. They are not morally pure either, atheism does not scale up well at all. Christianity: Seems to be the lowest of the six categories. Here’s a link to my DeathCount spreadsheet if you want to see how I broke it up. See my sources… the Wikipedia links. I also linked to my xls. I did the categorization. Feel free to examine it.